Getting out of stuck seat belt is not what most people think of when buying a new car or a used one in good condition as a new ride. However, half the reason people survive situations that could kill them has to do with preparation. While car seat belts are designed to restrain and save, they can also get locked up, making it almost impossible for a person to escape a drowning or burning car. This is where the basic seat belt cutter/hammer comes in handy. 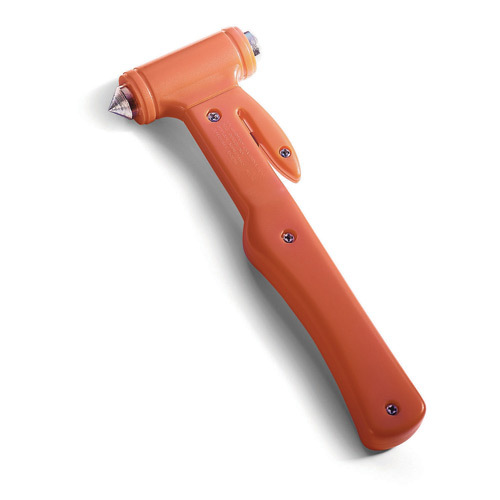 Kept in an easy to reach glove compartment within arm’s length of the driver, this tool provides a combination benefit. A small but extremely sharp blade is on one end to cut through a seat belt in seconds. On the other end is a tempered point that allows a user to break through a car window to get out with a hard enough hit. Every driver should have one of these tools stored in the compartment next to his or her driving seat. That way either the driver or passenger, whoever is able, can get everyone out of the car after an accident.